- Dream about writing a great novel? - Regret not finishing your paintings, poems, or screenplays? - Want to start a business or charity? - Wish you could start dieting and exercising today? - Hope to run a marathon someday? 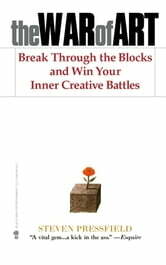 In this powerful, straight-from-the-hop examination of the internal obstacles to success, bestselling author Steven Pressfield shows readers how to identify, defeat, and unlock the inner barriers to creativity. THE WAR OF ART is an inspirational, funny, well-aimed kick in the pants guaranteed to galvanize every would-be artist, vistionary, or entrepreneur. This book was not as phenomenal as Joe would have you believe, but it's ok. It cuts to the core of procrastination, if that's your problem, and accepts no excuses. A military style approach to creativity. If you are a writer, then write, a singer then sing, a painter then paint, a pianist, then play. The book started off strong but fades off somewhere in the middle. 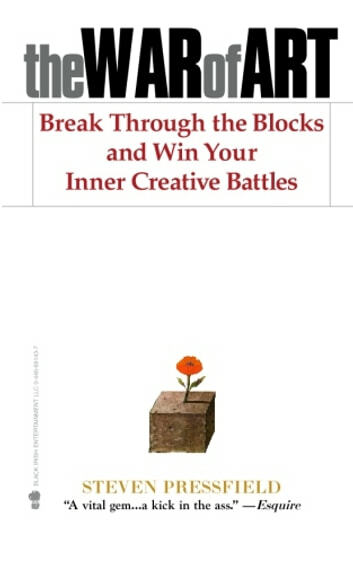 Worth reading if you’ve been procrastination on your artistic pursuits or need a bit of inspiration to stay motivated. Go create something - now! Steven Pressfield points out the evils of resistance and then sounds the clarion call to go forth and blast past it, to give the world what you've got. No matter your field, no matter your educational level, you've got something to contribute to the world. Presented in bite-sized chunks of wisdom and personal stories, this books' ideas are easy to get, but for most of us hard to do. He acknowledges the fight on every page, and implacably urges you go get over it and move forward. This book was lovely to read and imparts great wisdom. Anyone seeking to do what they're meant to do would benefit.